ALMOST 100 whales and dolphins died in two mass strandings near King Island. 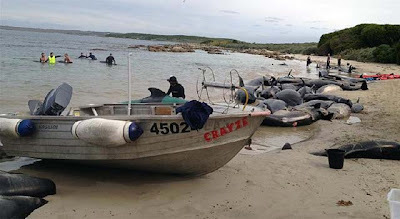 On Friday morning locals found 13 dolphins beached at Quarantine Bay on the island's north-west coast, while on nearby New Year Island a stranding of about 67 pilot whales and 20 dolphins went undiscovered until yesterday. On 18 October, 15 days prior to the beaching, a magnitude 5.9 earthquake occurred in the seabed 1298km south of Hobart Tasmania at 54.32 S ; 143.99 E. The quake was very shallow at 10km below the ocean's surface. The epicenter of the quake was situated at the bottom and to the left of the center of the above chart. The seabed danced about when the quake hit. This dancing acted like a powerful piston pushing and pulling against the water column, generating waves of intense pressure changes that swept over the the pod of pilot whales and the pod of dolphins causing damage in and around the air pockets of each whales head. 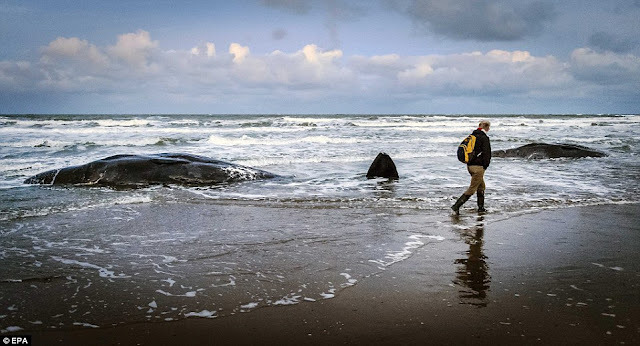 The injury, barotrauma in nature, caused the whales to loss their normally excellent sense of direction and prevented them from diving and feeding themselves. They huddled together and started to swim in a random direction. Water is 700 times more dense than air. As a result, there was much greater resistance to swimming in every direction except downstream with the surface flow. The distance from the epicenter to the stranding beach is about 1,400 miles. The time between the injury and the beaching was 15 days so the whales swam downstream about 100 miles per day.